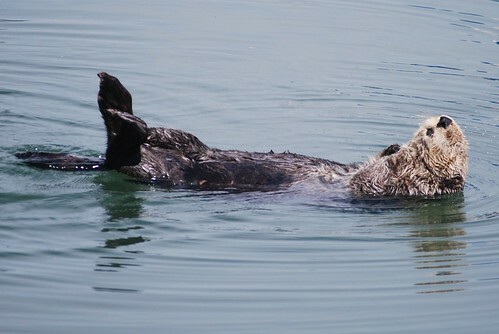 If you want to see sea otters in the wild, close up, there's really only one place to go. That's Moss Landing, a little fishing port halfway down Monterey Bay. The home of the Monterey Bay Aquarium's Research Institute, it's also the site of one of the bay's largest sloughs, full of birds and young fish. That's where the folk at MBARI release rescued otters, and a sizeable raft use the slough and the harbour to shelter from the wilds of the sea. Turn right (or left) at the big power station to cross over the causeway to the harbour. 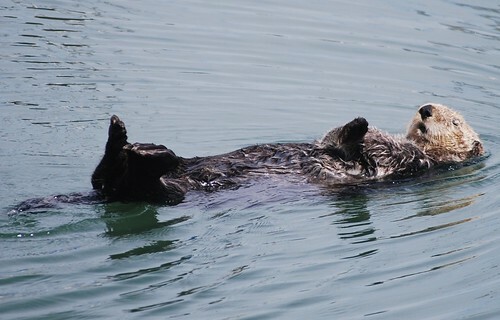 It's worth stopping here, as this is where you're most likely to see an otter close up. There' s bed of oysters and mussels at the base of the causeway, and usually one or two otters sculling around, basking in the calm of the sheltered waters. That's where this chap was, taking his morning ablutions on a hot California spring day. We'd stopped off as we headed down to Big Sur for brunch to celebrate marypcb's birthday at one of her favourite restaurants, and there he was, close in - washing himself and sculling his big strong tail to keep in place. 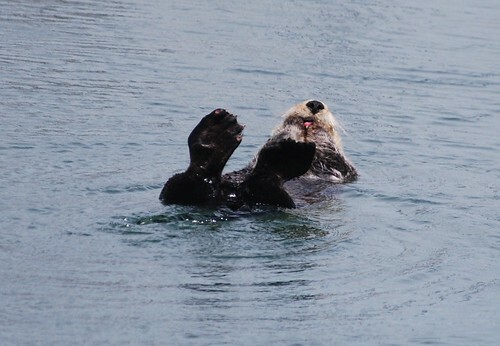 FYI, MBARI is NOT the group that does the otter rescues. The rescues are done by the folks at the famous Monterey Bay Aquarium (http://www.montereybayaquarium.org/). They do a really great job of it, too! They are in Monterey, about 30 miles south of Moss Landing.